The community-driven art project is meant to confront the negative imagery of informal settlements in Rio de Janeiro. Photo by Leonel Ponce. 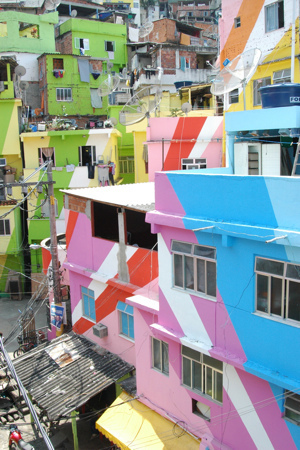 Dutch artistic duo Haas&Hahn worked with local residents to create a piece of art out of painted favelas, or informal housing settlements, in Brazil. The duo attempted the piece to counter the negative coverage and imagery of the favelas in Rio de Janeiro, Brazil. By casting the housing developments as a community-driven art piece, the artists have created a landmark and a monument of inspiration for Rio. 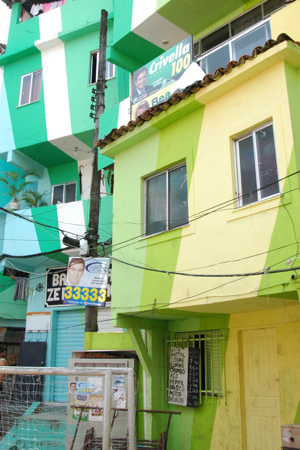 Praça Cantão, the duo’s latest favela painting project, spans 34 houses and covers 7,000 square meters. In order to reflect the true spirit of the community, the artists embed themselves into the culture, living in the favelas during the creation of the piece. 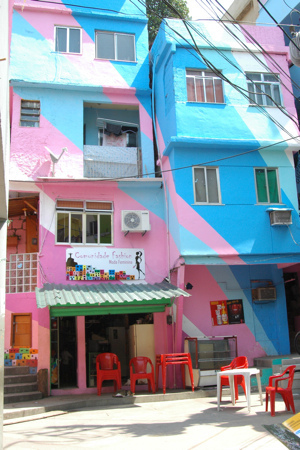 Praça Cantão wrapped up in 2010 but the artists remain active in the art world, exhibiting solo projects. Read more about the project and the artists here. Artists and the community worked together to achieve the beautiful final result. Above photos by fromtherightbank.